Dr. Balkar Singh Husson of Duarte, 87, who came to US in 1965 to pursue his Ph.D. in Genetics at U.C. Riverside, California, died on March 13, 2015, He got prominent positions in the Los Angeles County Department of Public Health.
" Along with Dr.Amarjit Singh Marwah, a well known and respected philanthropist in both the United States and India and Dr. Hakam Singh, Dr. Balkar Singh Husson became a founder member of Vermont Sikh Gurdwara (Temple), Los Angeles," said Dr. Piara Singh. " in 1974, Dr. Husson also became a founding member of Sri Guru Singh Sabha Gurdwara Sahib, Alhambra, California. In 2005, he moved in Walnut ."
. In 1983, he released his book "Epidemiology and Trends of Drug Abuse"
"Dr. Husson was the eldest in the family of 6 brothers and 3 sisters. His father died when he was going to college in Amritsar, Punjab," said Jagtar Singh, his younger brother who retired as class one officer (PAS) from punjab Government and now residing in Riverside, California. "As a college student after our father's death, he took the responsibilty of all his brothers and sisters by helping our mother." "After completion his BSc, he got a Demonstrator job in the same college to support the big family and along with his job, he got his MSc degree with standing top in the university." Jagtar Singh added. "We did not even consider him as an eldest brother but also like a father too." "Interestingly to know that we all, six brothers are post-graduate due to his efforts and help," Dr. Satinder Husson, MD who lives in San Diego, told NRIpress. "We, three brothers and one sister live in US and one brother in Canada." 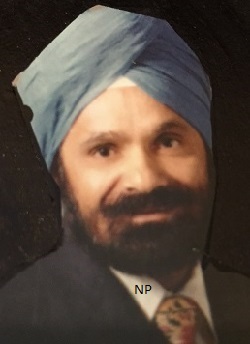 Dr. Husson is survived by his four children, Neelu, Gudu, Tony and Sonya and seven grandchildren, Sajmun, Arjunn, Simi, Kiran, Neven, Rajan, and Vanden. He is also survived by his five brothers, two surviving sisters, and nieces and nephews, in California, Canada, and India. A private cremation ceremony will be held on Thursday, March 26, 2015. A traditional service will be held on Friday, March 27, 2015 at Walnut Gurdwara Sahib, 20001 E. Walnut Drive South, Walnut,with Bhog at 6 p.m.